If you've been living under a rock since June, then you might have missed that Mega Man is making a long overdue appearance in Super Smash Bros. for the Wii U and 3DS. Nintendo is going all out to please disenfranchised fans of the Blue Bomber, and this latest daily screenshot shows that game director Masahiro Sakurai knows what they want. 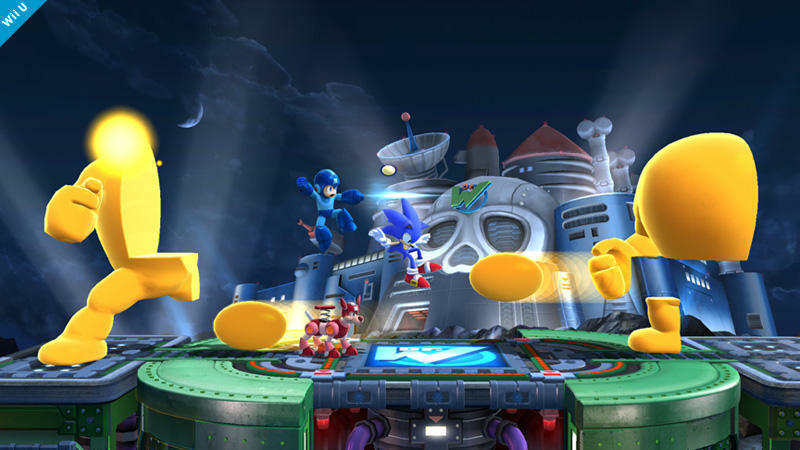 Mega Man will have his own interactive level during which I hope they play Mega Man 2's legendary 8-bit track Wily Stage 1 in the background. The map will throw plenty of classic Mega Man characters into the ring, but it is the Yellow Devil which takes the cake as the most amazing. His moveset comes straight from his legendarily difficult boss fight from the first Mega Man game, slowly disintegrating and piece by piece flying across the screen, forcing Mega Man to dodge. Only, I don't think players will be able to exploit the pause button glitch to counter is attack. Who knows? Maybe they'll work something like it in. Super Smash Bros. was recently rumored to be getting a Spring 2014 release, so keep your eyes peeled for more characters, and pray for Captain Falcon!